Featuring the first ever Australian Capcom Pro Tour Premier Event, #BAM9 will be a key destination for the prestigious global circuit. Already confirmed are world famous champions Daigo, Infiltration, Xian and Momochi. This Street Fighter V tournament alone will have over $20,000 in cash prize pool. BAM9 will also be the first tournament featuring the final build of Tekken 7, including a free to enter New Challengers tournament and Learn to Play. Plus, the biggest Smash Bros event in the southern hemisphere. With Five stages of major and side tournaments across many gaming communities, alongside Cosplay, Artists, and Vendor booths, BAM9 has something for every gaming fan. About: As one of the original esports scenes, the Australian Fighting Game Community (FGC) has flourished. 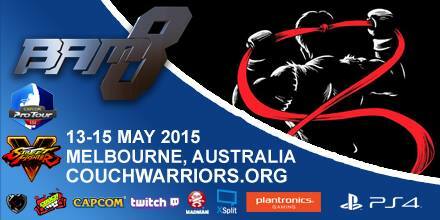 Organised by community events group CouchWarriors, now in its 10th year, BAM9 will be bigger than ever, both for casual fans and competitors hungry to prove themselves in interstate rivalries or against international competitors. A major esports championship, with over $20,000 in prize pool for Street Fighter V alone. Previous world champions Daigo (Japan), Infiltration (South Korea), Momochi (Japan) and Xian (Singapore) have signed up with more to come. Will be broadcast on the official CapcomFighters channel with commentary from Mike Ross (ESPN and CrossCounterTV). The winner will receive a huge points boost on the global ladder to qualify for Capcom Cup 2017. Tekken 7 will be a major presence with its own dedicated stage area. Play final code for TEKKEN 7 three weeks before release. With the final build on the floor in abundant setups, fans can join the New Challengers tournament for free, Learn to Play from community experts and make their mark in its first major tournament for cash and prizes. Two Massive Stages will feature tournaments across both SSB Melee and Smash 4. The amazing growth in the Smash community sees its epicentre at BAM. Top Australian players will face off. with International guests, incl is SoCal USA’s Nakat, with more to be announced, funded through the Smash community! Become the CouchWarriors Cosplay Champion, showing your fighting spirit in your best fighting game costume for a chance to win some awesome prizes, including tickets to OzComicCon Melbourne and a cash prize pool of $500. Plus Side Tournaments and Casual play for a huge range of additional games, Vendor Booths, Artist Alley, an awesome BAM9 Afterparty, and more. Play the final game three weeks before release! All Entrants to Tekken Main Tournament get a Free Tekken 7 T Shirt. See the PC version of Tekken 7 in 4K on a massive Samsung TV! A major stage for each game! 9 Side Tournaments and casual stations for many more titles.